Remodeling an historic building to allow for modern day furnishings had one contractor looking for help on how to provide better energy efficiency without ruining the longstanding structure. 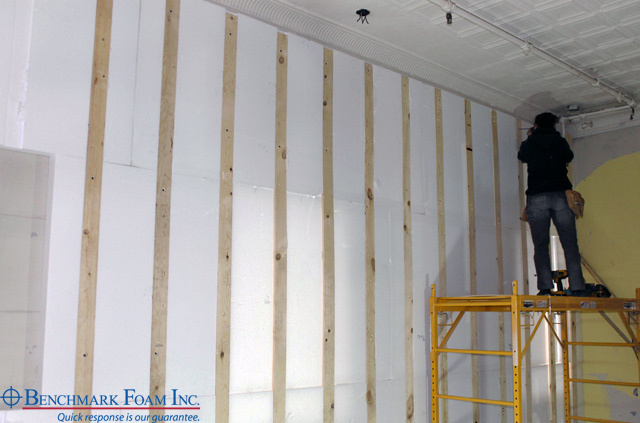 Benchmark Foam had the perfect fit: PreFirred insulation. PreFirred insulation is made of high quality expanded EPS polystyrene with an embedded firring strip. The sheets come standard in 4′ x 8′ x 1 1/2″ or 2″ thickness, but are customizable in many ways. Benchmark can custom-cut PreFirred to many finished sizes and thicknesses, depending on the building requirements. The wood firring strip can be customized to offer different sized attachment points and on-center options. For the remodel project, the contractor decided to use PreFirred with a 1″ x 4″ firring strip mounted in six cavities per sheet to allow for easy installation. Benchmark’s On-Time delivery guarantee played an important role because the space is being remodeled for a local displaced church group that needed a location to congregate sooner, rather than later. Appropriate for interior or exterior applications, PreFirred offers a quick fix for many project requirements. And with the industry’s only On-Time Guarantee, your order will always arrive on schedule. For projects that face minimum requirements, including the R-15 for foundation wall insulation in Minnesota, Benchmark has several options to satisfy this new requirement, including PreFirred. If you have questions about how to use Benchmark Foam insulation to meet certain codes, call us at 800-658-3444 with your plans and we can help find the right solution.